Be a pickleball guru and celebrate the most important shot in pickleball, the dink. 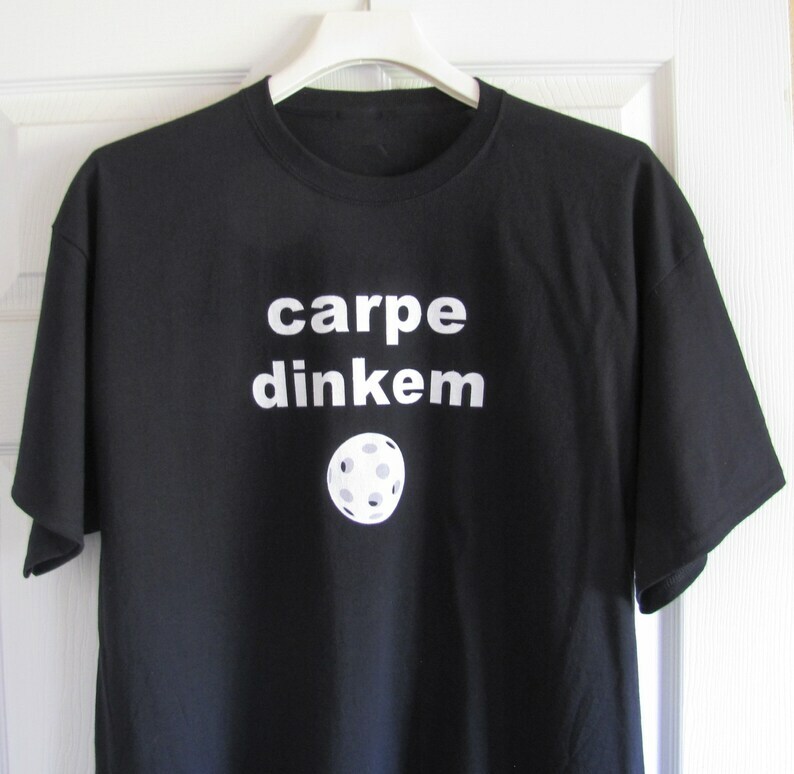 Express your enthusiasm and pickleball IQ with this Carpe Dinkem™ black cotton Tshirt. Only pickleballers will understand this "insider" expression, leaving non pickleballers scratching their heads and searching their Latin dictionaries. But they won't find Dinkem, as it is a term we developed just for the pickleball community. Carpe Dinkem™! If you live and breathe pickleball this shirt is for you. Our game changing apparel is ready to order in four sizes. It is fun, sophisticated, versatile and 100% pure pickleball! If you could own only one pickleball shirt this would be an excellent choice. It's a black shirt with white lettering and graphics. It makes a statement on the public courts as well as in your favorite public house. Day or night. We offer this shirt in a light weight cotton to provide superior comfort and coolness on the court and off. With your purchase you will receive a 3 x 10 Carpe Dinkem bumper sticker. (While supplies last). Awesome shirt and I got it within a few days of ordering! Layaway schedules are accepted on items over $100 in total cost. Three equal payments must be made within a maximum of 90 days. When the final payment is made the items will be shipped. Layaway payments are non refundable. Contact Bill Reimbold to set up the layaway plan for your desired purchase. Items with reduced on sale prices cannot be put on layaway.